Following release of photos of the next model BMW 3 Series (the E90), the factory was forced into releasing more details, earlier than they had anticipated. We even got Chris Bangle, BMW’s love him or leave him director of styling in Bangkok, to talk about the car a few weeks ago. Looking at the front view, the characteristic Bangle headlights have been adopted, though tamed down a little. It is in the rear that the BMW final OK was only given to a very slight change from the previous series, and the largely unloved Bangle Bottom was not adopted. The following details were gleaned from BMW, so there could just be a small amount of bias; however, knowing BMW (and I am a fan of the marque) there will not be large amounts of exaggeration. BMW have been making some very good cars in the last few years - and building them here in Thailand too. It has been pointed out before that these are not Thai BMW’s, but BMW’s made in Thailand. Powering the fifth generation of new BMW 3 Series is a range of engines all married to a standard six-speed manual gearbox (six-speed automatic optional). Topping the range is the BMW 330i featuring the most powerful, yet lightest, six-cylinder engine in its class - the same engine that powers the recently launched BMW 630i Coupe. Delivering 258bhp and 300Nm (221 lb-ft) between 2,500 and 4,000 rpm, this engine powers the car from zero to 100 kph in just 6.3 seconds and on to a limited top speed of 250 kph. 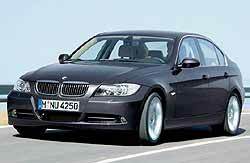 However, this is not at the expense of economy, with the new 330i delivering 33.5mpg combined fuel consumption. This engine sees BMW use magnesium in its construction process for the first time in large-scale series production. The crankcase jacket, bedplate and cylinder head cover are all made from magnesium, which weighs 30 percent less than aluminium. Additionally, the new 3.0-litre unit is the first six-cylinder engine to feature BMW’s patented Valvetronic induction system that infinitely varies the intake valve opening times and, when combined with Bi-Vanos variable camshaft timing, delivers the optimal fuel efficiency and engine response. Also joining the six-cylinder model range in spring 2005 will be the 325i, delivering 218 bhp at 6,500 rpm and 250 Nm (184 lb-ft) at 2,750 - 4,250 rpm. The new 3 Series range will also feature a two litre diesel and a two litre petrol variant at launch. The BMW 320d, currently the UK’s most popular 3 Series model, features second-generation common rail diesel technology and a variable vane turbocharger to deliver 163 bhp and 340 Nm (251 lb-ft) of torque. This provides the car with the best of all worlds. Acceleration to 100 kph is achieved in 8.3 seconds with a top speed of 225 kph. The engine in the new 320i is based on that of the outgoing 318i, but with enhancements to the induction and exhaust systems. Also benefiting from BMW’s Valvetronic and Bi-Vanos systems, the new 320i offers 150 bhp at 6,200 rpm, with a maximum torque of 200 Nm (147 lb-ft) achieved at 3,600 rpm. Ensuring that the power and torque remain in check is the responsibility of the new DSC+ system (on six-cylinder models - standard DSC on four-cylinder models). Effectively an evolution of the familiar DSC traction control system, DSC+ offers a range of benefits, including brake standby that pre-tensions the brakes when the driver quickly removes the pressure from the accelerator pedal. Soft stop is also incorporated which modulates the brake application to prevent the nose of the car from ‘diving’ when travelling slowly. Also included in DSC+ is a start-off assistant that uses the clutch to prevent the car from rolling back on a hill-start and a brake detector that ensures the discs are kept dry and responsive on wet roads. 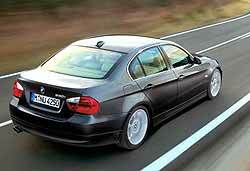 The new E90’s have BMW’s active steering system, available for the first time in a car of this class. Active steering is offered as an option on six-cylinder models and resolves the conflict between low-speed agility and higher-speed stability by delivering a speed-proportional steering ratio. Active steering also brings a number of key safety benefits. In conjunction with the DSC+ system, if the car detects over steer, active steering applies a small amount of positive steering angle to bring the rear of the car back into line. Additionally on the new 3 Series, when applying the brakes on a surface with differing grip levels such as snow or ice, active steering intervenes to stabilize the car more precisely and quickly than the driver is able to do manually. Its double-joint spring strut front axle is made completely of aluminium, minimising the unsprung mass of the car and reducing road noise. The new five-arm rear axle, first seen on the new BMW 1 Series, delivers excellent ride comfort. The new 3 Series body is stiffer yet lighter than that of the outgoing model. Thanks to a new joint and crossbar arrangement for the car’s load-bearing structure, the bodyshell stiffness is increased by 25 percent over its predecessor. The inherent rigidity of the steel bodyshell enhances the new 3 Series safety levels. With the addition of six airbags as standard, including curtain head airbags for front and rear occupants, the car is expected to receive a five-star Euro NCAP rating. It is also one of the first cars in the world that is fully prepared for the rigorous side impact requirements in North America as well as the US high-speed rear impact test. 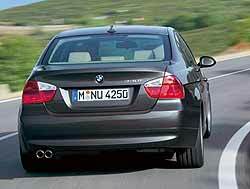 Also supporting these high standards of safety are a number of familiar systems from other BMW models. Brake force display is standard for the first time on 3 Series Saloon models, offering two stage brake lights. Brake lights illuminate normally in average driving conditions but during an emergency stop or when the ABS braking cuts in, the area of brake light illumination increases to warn those travelling behind of the situation ahead. Run-flat tyres are available for the first time on 3 Series models. Like the 1, 5 and 6 Series models, run-flat tyres are offered as standard, and with the recent developments in run-flat technology, the car can now be driven for an astonishing 150 miles at 80 kph with up to four punctured tyres. This allows the driver to complete almost any journey before replacements need to be sought. The new car is larger than before. Measuring 4,520mm (+49mm) in length, 2,760mm (+35mm) in wheelbase, 1,817mm (+78mm) in width and 1,424mm (+9mm) in height, the new BMW 3 Series offers a spacious and light cabin. A driver-orientated dashboard layout places all the primary controls at the driver’s fingertips while the secondary controls are conveniently and ergonomically accessible. Rear occupants benefit from an increase in head, shoulder, elbow and leg room. For those customers opting for either business or professional navigation systems, BMW’s (controversial) iDrive operating concept comes as standard for the first time in a car of this class. Replacing the conventional single hood dashboard layout, the display screen sits centrally on the dashboard in a second binnacle to deliver navigation information alongside on-board computer information, entertainment and climate control adjustments and check control messages. 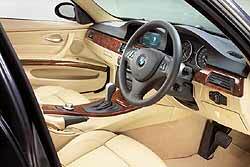 Also available for the first time on a BMW in this class is Comfort access. All cars receive a newly designed key that replaces the conventional blade-type key but with comfort access the key contains an ID sensor that the car recognises from a short distance away. On recognition, the doors are unlocked automatically and the car can be started with one push of the starter button. The comfort access system also works in tandem with BMW’s familiar key memory system to ensure that the seating position, door mirrors, personalized air conditioning settings and radio reception are automatically adjusted to the current drivers’ settings before they enter the car. Last week, I mentioned that we used wood for wheel spokes for many years, and in fact the last recorded use of wooden spoked wheels was on the Mercedes Nurburg of 1939. However, some cars were built totally on a wooden unitary construction, such as the Marcos GT of 1960. Marcos was not the first to do this, as Marks-Moir in Australia tried it in 1923. But who was the first? I wanted to know the car company and the date. The correct answer was Lanchester in 1922. So to this week. With all the hysteria over crude oil prices and saving power, there is much talk about changing to alternate fuels. Gasohol has been pushed by various (vested?) interests, and biodiesel as well. Now diesel was named after Rudolf Diesel, so this week’s question is where did the name ‘petrol’ come from?